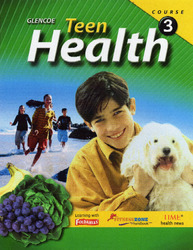 Teen Health is written especially for middle school students. The eighth grade book in Glencoe and Macmillan/McGraw-Hill's K-12 health program along with Glencoe Health (high school), Teen Health Courses 1 and 2 (grades 6-7), and Health & Wellness K-5 (elementary school). Get fit and active with in-depth fitness and nutrition information and Glencoe's exclusive Fitness Zone. Cross-curricular integration throughout the program with the Reading Skills handbook, reading and writing strategies, academic vocabulary, Connect To activities (math, science, and social studies), and Standardized Test Practice. Activities based program with an emphasis on health skills, avoiding risk behaviors, and promoting health literacy. The latest technology including Health eSpotlight chapter launcher videos, podcasts, online student edition, StudentWorks Plus, and TeacherWorks Plus.